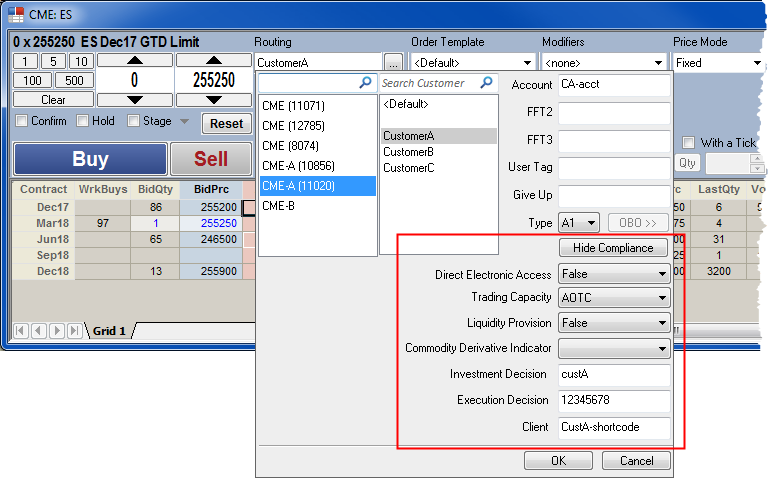 In the following example, the customer defaults are configured with the short code (e.g., 12345678) of an individual trader, who is also the same trader making the investment and execution decisions. Indication of who made the trading decision. Enter a Short Code. Indication of who or what algo submitted the order. Enter a Short Code. Identification of the customer. Free text. 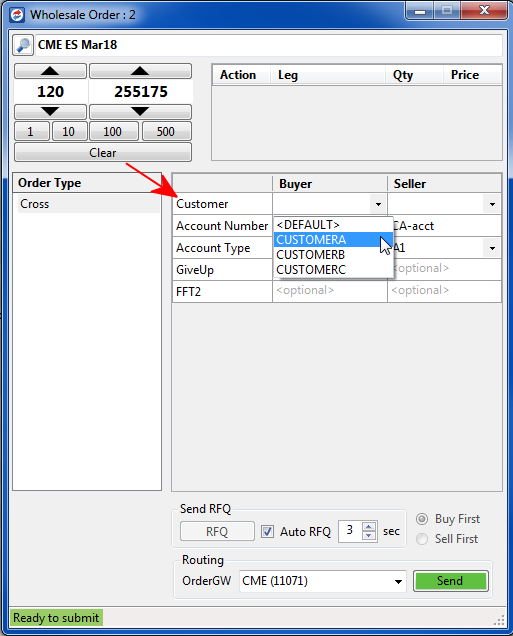 The Customer Defaults window includes an Algo Defaults pane used for configuring default settings on algo orders. To switch to the Algo Defaults pane, click the Switch To Algo Defaults button in the top left corner of the Customer Defaults window. Risk administrators can create Algo Defaults for X_TRADER users in TT User Setup and configure them so that end users cannot overwrite their values. After displaying the Algo Defaults pane, algos are selected in the Algo Name column. Anytime one these algos is sending an order and there is a match in Algo Defaults, then X_TRADER will add the applicable Investment Decision, Execution Decision, Liquidity Provision, and Direct Electronic Access fields to the algo orders sent to the exchange. These fields will override any values set in Customer Defaults. If a field is blank in Algo Defaults, the value in Customer Defaults will be sent to the exchange. For ADL, you have the option to register each ADL algo separately. In Algo Defaults, you can either choose ADL or enter the name of a user-defined, deployed ADL algo (e.g., Market Maker algo). The following example shows "CustAccount A" selected in Customer Defaults and "Autospreader" selected in the Algo Defaults pane. Since"CustAccount A" is selected, the MiFID II fields in Algo Defaults will override the corresponding MiIFD II fields for "CustAccountA" on Autospreader child orders sent to the exchange. Descriptions of the MiFID II fields in the Algo Defaults pane are shown in the following table. Required settings vary by exchange. When setting these fields, refer to MiFID II Order Fields by Exchange. To support MiFID II compliance, the applicable MiFID II fields are sent to the exchange when you submit an RFQ. When submitting RFQ's from the Market Grid, Spread Matrix, Strategy Creation, Wholesale Order, and Quote Board windows, the MIFID II fields in Customer Defaults are sent to the exchange and displayed as an INFO message in the Audit Trail. Note: The Spread Matrix, Strategy Creation, and Quote Board windows use the best <Default> customer match in Customer Defaults since you cannot change accounts in these windows. When sending an RFQ from these windows, ensure that the applicable <Default> customers have the MiFID II compliance fields set in Customer Defaults. To support MiFID II compliance, the applicable MiFID II fields are sent to the exchange when you submit a Wholesale Order. When a two-sided wholesale order is submitted, the RFQ that is sent includes the MiFID II tags for the buy-side customer. When you select a customer in the Customer drop-down, the MiFID II fields in Customer Defaults for that customer are applied to the order and sent to the exchange. To support MiFID II compliance, the MiFID II fields on working orders are saved as part of the Saved Order Parameters functionality in the Order Book and Orders and Fills Window (OFW). When saving orders to a CSV file, the MiFID II fields from Customer Defaults for the customer who submitted the order are added to the file. For example, if you select a 5 lot order in the Order Book or OFW, right-click in the grid and select Save Order Parameters..., the MiFID II fields on the submitted order will be added to the saved CSV file. When you right-click and select Load Saved Orders... to upload a CSV file to the Order Book, the saved order is placed on HOLD and the MiFID II fields in the file are included. When you submit the order, the MiFID II tags are sent to the exchange on the order and displayed in the Audit Trail. For example, if the above CSV file with the 5 lot saved order parameters is uploaded to the Order Book and submitted, the MiFID II tags will be sent with the order. The MiFID II fields in Customer Defaults are sent to the exchange on order actions and displayed in the Audit Trail. When exporting all rows from the Audit Trail in X_TRADER or X_RISK, the MiFID II fields are also included. By default, the MiFID II columns are hidden in the Audit Trail. Descriptions of the MiFID II fields in the Audit Trail are shown in the following table. Indication of who made the trading decision. Displays a registered ID/Short Code. Indication of who or what algo submitted the order. Displays a registered ID/Short Code. Identification of the customer (LEI/Short Code). Displays free-form text or non-standard exchange fields; e.g., Tag 9707-MIFIDID on ICE. Displays free-form text or non-standard exchange fields. Descriptions of the MiFID II columns in the Order Book, Fills, and Orders and Fill Windows are shown in the following table. Indication of who made the trading decision. Displays a registered trader ID/Short Code. Indication of who or what algo submitted the order. Displays a registered trader ID/Short Code. Shows identification of the customer (LEI/Short Code).